The approximately 25 courses we eat don't seem so bad when they're spread out in a span of 21 hours. And nearly all of it is nearly-vegetarian. On the other hand. Of course, about 20 of the courses are at one single meal -- at a Michelin 3-star restaurant -- and the total cream/butter intake must be approaching several kilograms. Paris has a reputation for gastronomic heaven, and we're finally getting our slice of it. I take Anthony out to a big dinner one night, and he takes me out to a huger lunch the next day. This might be seen as bad planning, but the kids are at camp, and we are celebrating our 15th anniversary. So all bets are off. My choice is Dessance, considered Paris' first gastronomic dessert-themed restaurant (that opened early this year in the Marais), for a 5-course meal -- one savory and four dessert courses. But the dessert courses build, starting with lots of fruit- and even vegetable-based desserts and getting more intense, sweet, and dessert-y as they go. For example, in the photo above, that green stuff you can just see poking out from under the mound of flavored mascarpone is icy pea granita. Not only can I not remember every one of the components now as I write this, I can't even remember all the components twenty seconds after the waiter leaves the table. "What did he say this stuff was? Some saffron cookie crumble thingie?" This is not just very delicious, it's also very unusual. Is it a vegetable? Is it a dessert? Is it a side-dish? It's really hard to tell, and that's the point at this restaurant. But I'd eat it again in a heartbeat. This course looks a little more dessert-y, with its blackberries and cookie crumbs, and cream. But it's still only light sweet. Rich as all get out, but only lightly sweet. And then they're this baked-Alaska style, Scandinavian-influenced pine-infused meringue covered citrus curd. The meringue alone is so pine-y, we feel we are actually eating the tree sap. This not necessarily a good thing, but just a little of the meringue with a good spoonful of curd turns out be smoky, deep, and complex. Now we see the power of the pine. And finally, we're on something that actually looks more like a "regular" dessert. It's a bunch of flavors of home-made ice cream, ices, brittles, and sauces. Don't ask me what flavors. I am entering food coma, and what little information I was absorbing before is now trapped behind the many globules of cream in my brain. I am thankful Anthony is feeling all better -- and hungry -- by lunch on Friday, because we don't take reservations at a Michelin 3-star restaurant lightly (only our second or third, the other being French Laundry in the Bay Area; we have eaten at Saison in San Francisco, but that was before it was awarded 3 stars, so I'm not sure if that "counts"). Anthony, who has been on a whole-food, nearly-vegan health-food kick (with occasional cheating, obviously) for a couple months now and who knows that I am all about the veggie and fruit side dishes and sauces, chooses the one and only perfect 3-star restaurant for our anniversary meal. Chef Alain Passard's restaurant Arpège, in the 7th arrondissement, is known for having done something truly radical: he removed all forms of meat (besides the occasional fish) from his restaurant. He doesn't claim to be vegetarian, as he does flavor things with great hams and bacons. But other than the occasional and very small amount of fish, you won't eat any red meat or poultry at his restaurant. And you won't miss it. I don't get photos of every course that runs by us here, either, generally because it's so appetizing we often just dive right in. But we start out with beet, carrot, and pea purée tartelettes. With edible flowers. In pretty crust cups. Beetroot sushi: It's light, and mild. It's nice, certainly, but officially Anthony's least favorite course. Possibly mine, too. Which isn't to say that I wouldn't eat an entire plateful for a snack right now if I could. We probably wouldn't have ordered the pasta if we were ordering à la carte, dismissing it as too plain (who goes to a 3-star restaurant and orders pasta?! ), so we're both happy that we're doing tasting menus, where the choice is up to the chef. This simple broth with handmade pasta and seasonal vegetables is, in a word, outrageous. It has about as much in common with the ravioli I eat at home as a Pavarotti aria does with me singing in the shower. Sure, they're basically just grilled mushrooms (cèpes) on mashed potatoes. But there's a sweet-salty crunch, and it's perfection. It's like mushroom candy. They should give this out at Halloween. I'm in heaven. It may be the one dish I would eat every meal of my life, if given the chance. It almost pains me to give Anthony some tastes of my mushrooms (it must be true love); while his corresponding course is still quite good, it's less spectacular. What was that?! I can't remember, and I can't identify, but I do know we enjoy it at the time. The onion gratin is candy-like. Without exaggeration, I would be happy eating the onions gratin as dessert. When I say Chef Passard is "nearly vegetarian", it's because of dishes like this: a thick pumpkin soup with a cream flavored with some sort of bacon. Oh, bacon. And insane amounts of cream. You really bring the humble pumpkin up a few notches. At one point, an entire fish parades through the restaurant for those who've ordered that particular menu. I actually do have some fish on my menu, though it doesn't come off that monster fish. Fall vegetables, mostly from his own gardens outside the city, are consistently elevated to perfection. One of our courses is a Moroccan-influenced dish (not the cous-cous). Though the entire dish may not be my single favorite of the evening, the tomatoes in it, which the chef has done in a confit-style, are so delicious that I inadvertently exclaim, "ooh!" then get choked up and actually start to cry. I literally cannot speak. I can't tell you if it's because I'm sad that I won't get to have that flavor any time I want it, or because I'm simply so astonished that something can be that delicious. I tell the chef, when he comes around later to chat up the room and wish us happy anniversary. I figure, if I were able to cook something so incredible it actually brought somebody to tears, I'd want to know. Chef Passard is unusual not just for his decision to go nearly meat-free: Despite being a big name, he continues to do a lot of the day-to-day cooking himself, overseeing the small kitchen in person. And he's also a very friendly, down-to-earth guy; he not only comes around to chat with folks, he actually sits down with one woman whose friend is in the bathroom. It probably doesn't hurt that she's a pretty young lady, but I suspect he'd sit and chat with just about any friendly face. The chef has just one picture up in his restaurant, of his grandmother, a cook and also his inspiration. She would have been proud. It's such a classy restaurant, they serve their silverware upside down. I so wish I could make a meal turn out this wonderfully just by setting my forks tine-side down. There are too many dessert courses to count. Can I remember what flavor this pot de crème is? No. Just that it is insanely rich. Sure, it may only be three spoonfuls, but the chef seems to have somehow condensed a pint of cream in each bite. The pineapple Napoleon: I almost finish it. We are, by now, roughly 18 courses and three or four desserts in, yet they still bring out a special anniversary dessert for us -- a croquembouche made of mini apple tartes shaped like roses. Of course. By the time we leave, after a few chocolates, homemade tomato confit candies, and petit fours, we are practically rolling out the door. Arpège sends us out with souvenir knives, but I can't say that I need a memento to help me remember the meal. It is most definitely one of the greatest meals of my life -- and so rich, it might just see me through to my 16th anniversary. Révélation is a raw sheep's milk cheese with cracked poivre de timut (timut pepper) in the layers of the cheese, which hails from Ossau Valley (home to the famous Ossau Iraty sheep cheese). 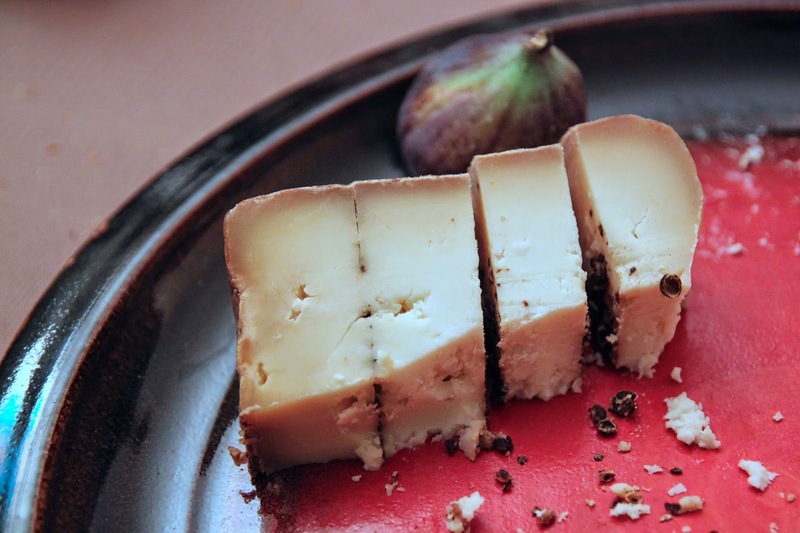 Poivre de timut is a gourmet Nepalese peppercorn -- not your usual French cheese fare. In fact, the only other time I've seen it used is with Escarecelle, and that's no coincidence: Both Escarcelle and Révélation are made specifically for Laurent Dubois and his cheese shops, and M. Dubois "designed" both of these cheeses. Another version of Révélation, called Tartuffe, is layered with truffles, resulting in a very different aroma and taste. For a hard cheese, Révélation is surprisingly creamy, other than the chewy pepper bits. The rind is rough and dry, but I really enjoy the taste and texture of it. It's got a sort of pasty, peppery feel to it and is like some sort of cheese-pepper-candy nugget in my mouth. The cheese just sheers into pieces when cut and served. That's OK, because you can pick it off layer by layer. Révélation is the kind of cheese that needs to be stored separately. It really has a knock-you-over waft of stink it emits, partly from the cheese and largely from the pepper. Let's just put it this way: I'm amazed I don't sneeze around it. And the taste follows suit: creamy, herby, with a truly unusual stink and tang. The pepper kick doesn't make it all that spicy, but it gives it a really different sweet muskiness that I haven't tasted in any other cheese. Frankly, I choose this cheese because I feel that the tomato confit (and so much of the rest of both menus) is, indeed, a revelation. I just would never have known any individual bite -- of anything -- could ever taste so delicious. Révélation is rather a foofy gourmet cheese, too: limited production, exclusive sales, unusual imported ingredient, unusual flavor pairing. But, you're wondering, did I have the cheese plate at Arpège? No. It is not on the tasting menu, and, frankly, it's not something I'd order at this point at a restaurant, since I have so much exceptional cheese at home and -- let's face it -- their cheese is not any better than the top-notch cheese I buy myself. But I am super curious: What's on the cheese platter here? They wheel it over so we can talk cheese and, yes, I can name half of them just by sight, and make an educated guess at the other half of more generic-looking ones. Starting with the pyramid and going clockwise: Pouligny St. Pierre, Comté, Livarot, Sainte Maure de Touraine, Losange, Cathare, and St. Nectaire.